Over the past six months I’ve had several people suggest the idea of planning a get together where I showed everyone how to make sushi. I finally decided to make it happen and enlisted a trusty team of accomplices to pull it off. 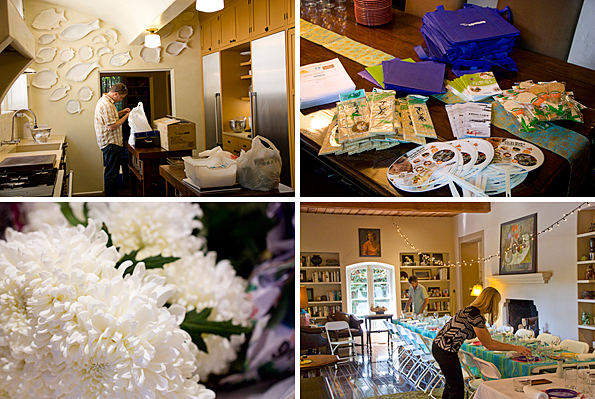 Over the month and a half that it took us to plan everything, the event slowly morphed into a bigger (and better!) event. 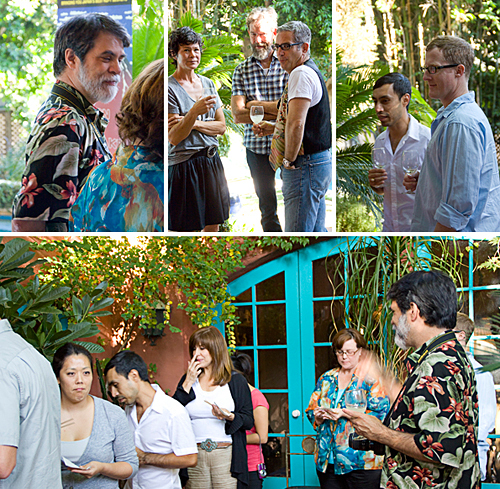 Greg (Sippity Sup) offered up his gorgeous home as our event location. 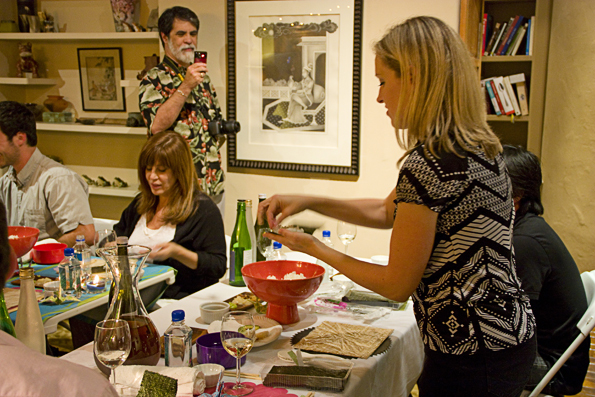 It turned into an amazing evening attended by 21 people where we learned the basics of making sushi rice and sushi, learned about seafood sustainability, and feasted on a wonderful meal of appetizers, sushi, side dishes, drinks, and desserts. On top of an evening of learning and good food, the event also helped to benefit a great cause. The event was chosen to be one of the 24 meals to be featured in Foodbuzz’s extra special September 24×24 event. Foodbuzz has teamed up with Electrolux for this month, who has committed $750,000 to the Ovarian Cancer Research Fund, and this month’s event is benefiting the OCRF by contributing a donation of $250 in each of the participants’ names! 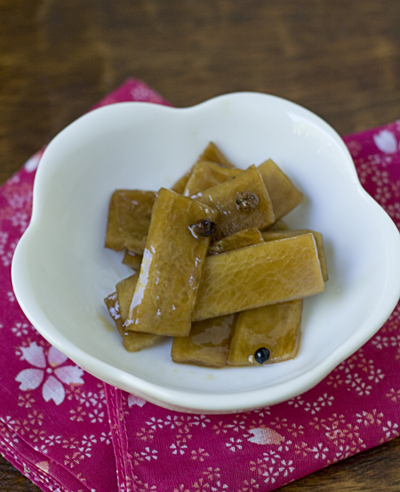 and made some daikon hoajo-zuke (pickled daikon radish with Sichuan peppercorns). The day of the event Mr. Fuji, Josie (Daydreamer Desserts), and I drove over to Greg’s house, unloaded our packed car, and got to work. Jen (Devour the World) arrived soon after with some additional supplies. 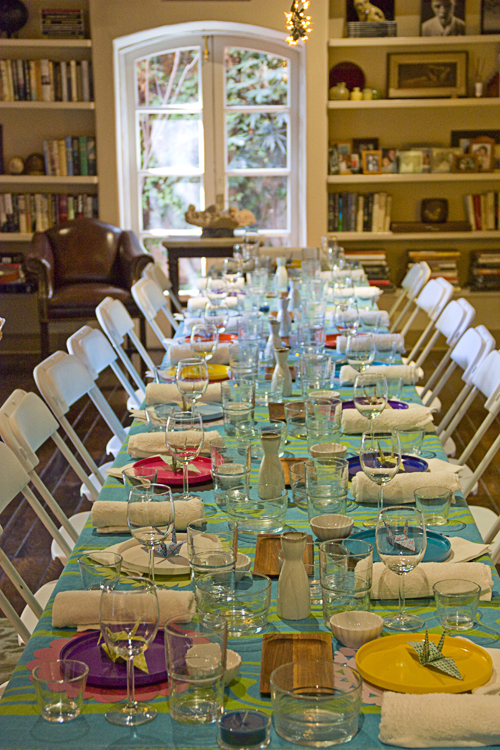 There is a lot to do when preparing a multi-course meal for a group of 21 people! We started with things like adding some finishing details to the beautiful table that Greg had already set for us and putting together gift bags. Then we moved on to prepping the food. Two different companies provided some equipment for the event that made our prep work much easier and more enjoyable. 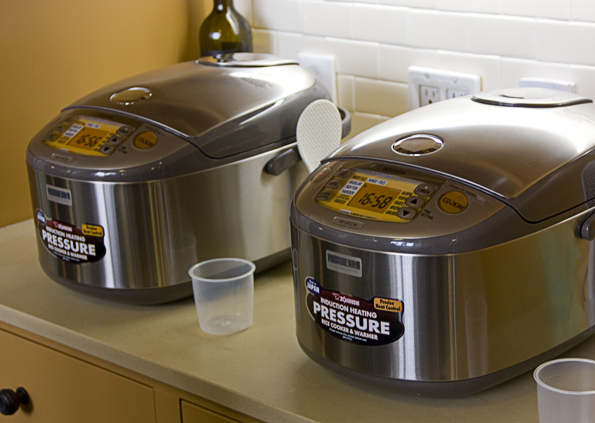 Zojirushi provided two of their amazing 10-cup Induction Heating Pressure Rice Cookers. I don’t know what we would have done without these! Not only did it streamline our rice making process (we had to make a lot of rice), but these cookers also produce perfect rice every time—a nice thing to be able to rely on when you’re trying to provide enough rice for 21 people to use to learn how to make sushi! Ergo Chef provided 3 knives for all of the slicing, chopping, and dicing we had to do. 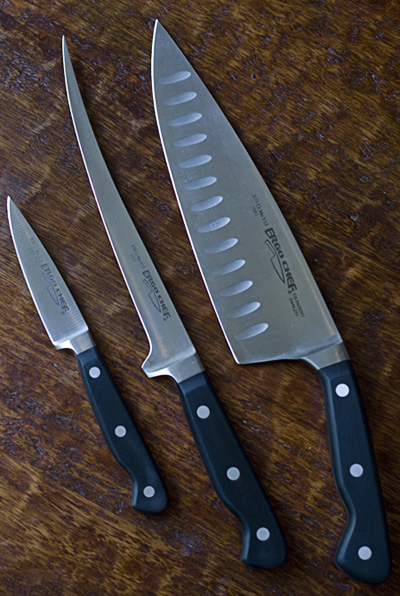 We got to try out their 8-inch Chef’s Knife with Hollow Ground Edge, their Fillet Knife, and their Paring Knife. They also sent along a Carving Knife that we got to give away as a door prize! Martin (the owner of I Love Blue Sea) and Matt (one of the guys working with him) drove all the way down from the Bay Area the morning of the event with our fresh seafood. When they arrived, they immediately rolled up their sleeves and pitched in (their mothers should be proud). When the rice was cooked, Jen and I made the sushi rice, fanning the rice to cool it, and slowly adding the sushi zu (seasoned vinegar). I took advantage of the situation and got a free rice steam facial from Jen, who is a master wielder of an uchiwa (fan used for fanning rice). When people started arriving, we started with appetizers and cocktails outside by Greg’s pool. and SushiZuri made a gorgeous assortment of salmon, tuna, and blue crab tartars with baked wonton crackers. Just thinking about them makes me swoon, they were so good. Everyone moved indoors and took a seat at the long table. 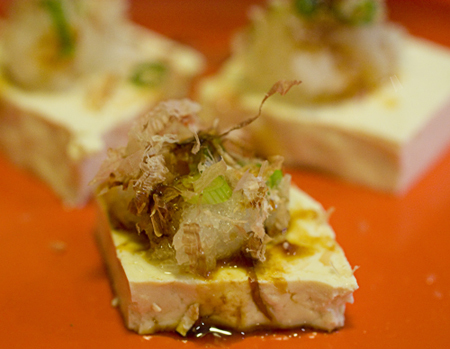 We started our meal with hiyayakko—a popular Japanese dish of chilled tofu served with toppings. I made all the tofu during the 24 hours prior to the event so that it would be as fresh as possible. There is nothing like fresh handmade tofu! We sliced the tofu into small squares and topped each square with a bit of grated daikon radish, katsuobushi (smoked bonito fish flakes), sliced scallions, a drizzle of soy sauce, and a few drops of toasted sesame oil. 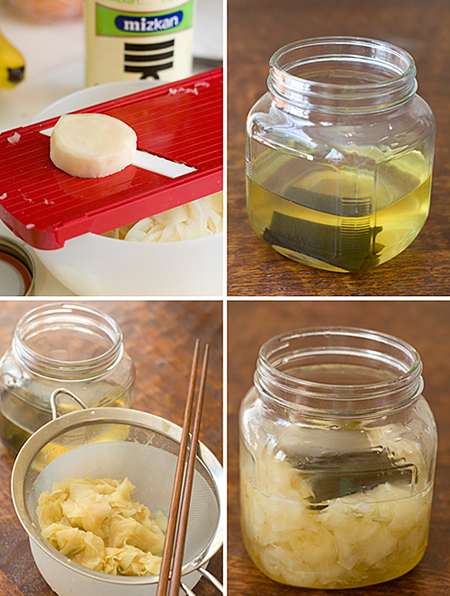 * Make your own tofu. 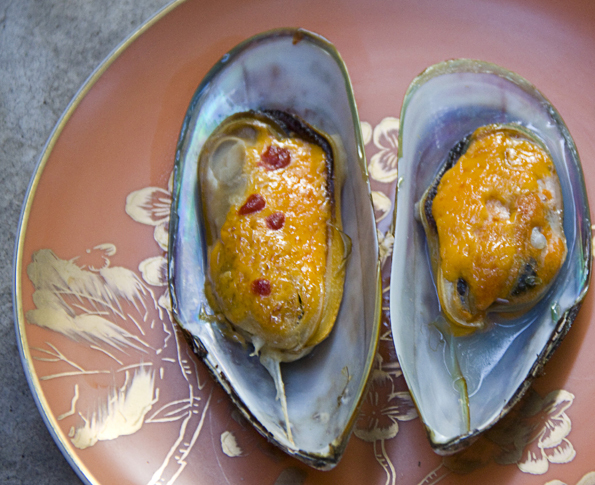 Martin (I Love Blue Sea) topped some fresh Green-Lipped Mussels with a mixture of Japanese Kewpie Mayonnaise and sriracha and then put them under the broiler until they were cooked through. These mussels were absolutely amazing—tender and full of flavor and the sauce added a nice creamy and slightly spicy accent. As Martin explained, shellfish are often one of the most sustainable options. They require no fish meal; they take all of the protein they need from the water around them. In fact, they actually remove debris and nutrients from the water leaving the surrounding seawater cleaner! As this course was eaten, Martin gave a brief presentation on seafood sustainability and then conducted a wonderful discussion on the topic. 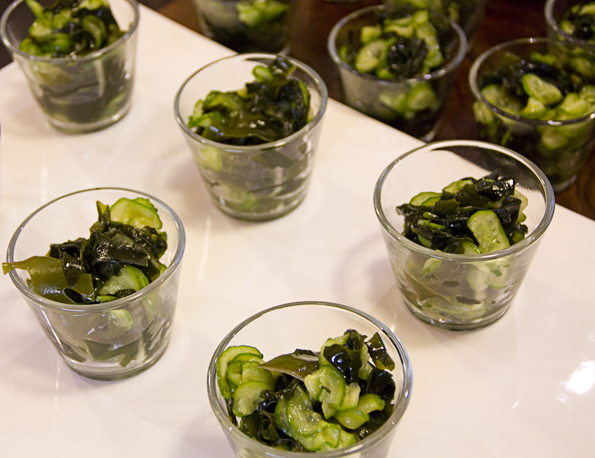 A light refreshing pickled salad made from thinly sliced cucumbers and wakame (seaweed) dressed in a sweet rice vinegar dressing. 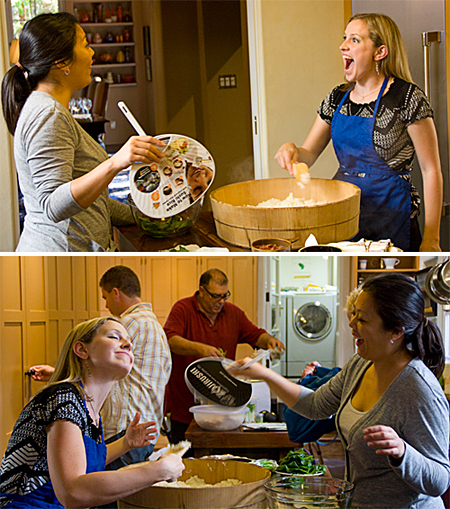 Before we started the fourth course, Jen and I gave a brief demonstration on how to make sushi rice. 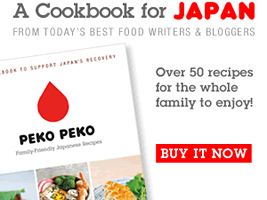 Sushi rice, or rice dressed with seasoned vinegar, is an essential component of sushi. My experience is that good sushi can be ruined by bad sushi rice. I wanted to show everyone that if they can make good sushi rice, there is no reason why they can’t make delicious sushi at home. 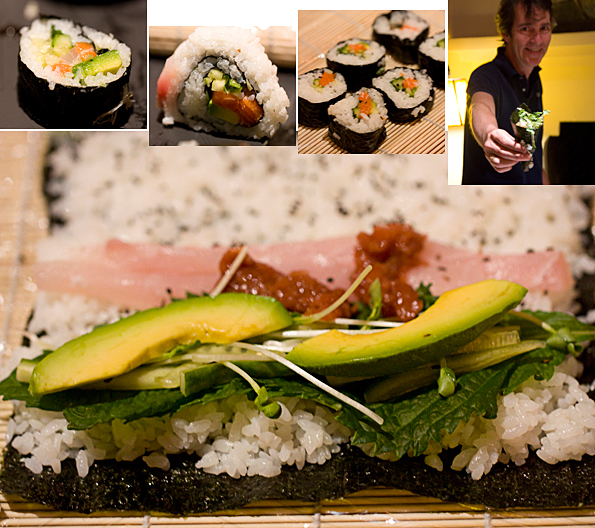 Then I demonstrated how to make temakizushi (a traditional hand roll in a cone shape) and then maki sushi (sushi rolls). Dungeness Crab: Strong populations coupled with effective management make this fishery resilient and productive. As Martin said, “Thank goodness, because it is so delicious!” The crab was sweet and moist and almost melted in your mouth. I could easily put away a pound of this stuff by myself. Wild Alaskan King Salmon: These have an aggressive and fairly effective fishery management program. 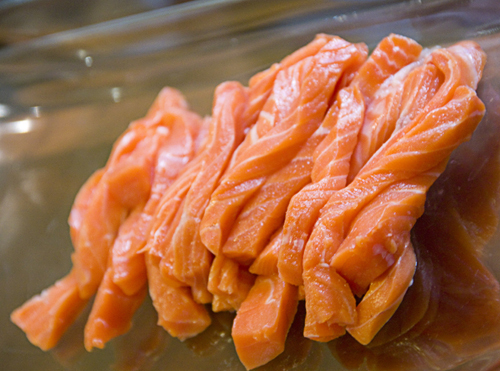 Farmed salmon, on the other hand, often has severe problems. The salmon was absolutely gorgeous and tasted just as good. Albacore Tuna: This particular albacore is caught using a hand line from a sustainable fishery in the North Pacific. The belly portion is mind-blowingly incredible. It is tender and rich, tasting a lot like avocados. All it takes is one bite and you’re addicted. Yellowtail: Caught off the coast of Southern California, these jacks – like mahimahi – spawn many times in a season producing prodigious numbers of offspring. While many years back they were overfished by purse seiners, today they are taken only by pole and line and have recovered to their once abundant numbers. The yellowtail was wonderful as well, with great flavor and texture. 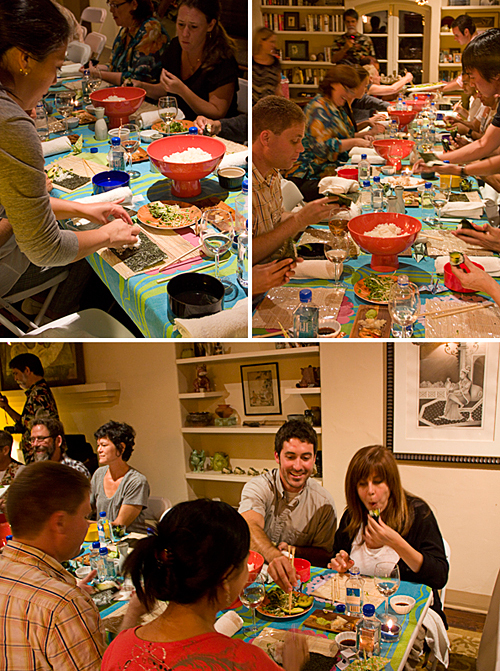 Everyone had a great time rolling and eating their own sushi. And look, they even produced sushi to be proud of! 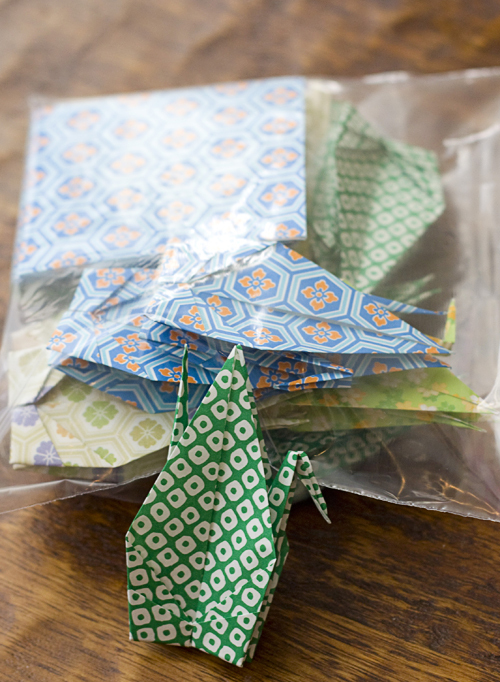 I told them that one of the fun parts of making sushi at home, is that if you mess up on a roll, that just means that you have to eat the evidence. Although it may not look right, it will still taste delicious! * How to make sushi rice. To finish off the savory courses we served a miso soup made with homemade dashi, a mixture of akamiso (red/dark miso) and shiromiso (white miso), wakame, fresh sliced shiitake mushrooms, and negi (a Japanese vegetable that tastes like a cross between chives and green onions). 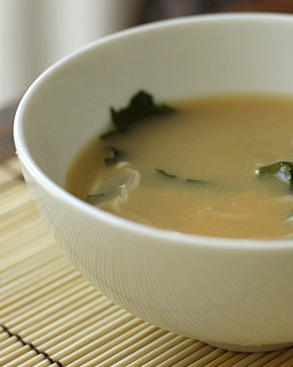 * Make your own miso soup. Josie of Daydreamer Desserts created a fantastic Japanese inspired dessert buffet: Pistachio Macarons filled with White Chocolate Pistachio Buttercream, Matcha (Green Tea) Macarons filled with a Mint-Matcha Buttercream, a Matcha (Green Tea) Ice Cream, Fuji Apple Sake Zabaglione Ice Cream, and a Yuzu infused Rice Wine Granita. * Get Josie’s recipe for Matcha (Green Tea Ice Cream)! The event was definitely a success and I hope that everyone had as much fun as I did! I couldn’t have pulled it off without a lot of help and support from some amazing people. Greg (Sippity Sup), who graciously opened up his home, set the table, provided dinnerware, julienned cucumbers like a madman, as well as accomplishing a whole variety of other activities. Jen (Devour the World), who was my sous chef extraordinaire, picked up last minute items on the way to Greg’s house, helped me go through our check list 5 million times to make sure we weren’t forgetting anything, and kept me laughing the whole night. Mr. Fuji, who came and helped beforehand without complaint, and has put up with me stressing out and being distracted by the whole thing like a saint. I love you! Martin and Matt (I Love Blue Sea), who drove down the morning of so that we would have the freshest seafood possible, worked like slaves in the kitchen, helped to educate everyone on the issues that face the sustainability of our seafood, and provided 2 $20 off certificates as door prizes. You guys rock. 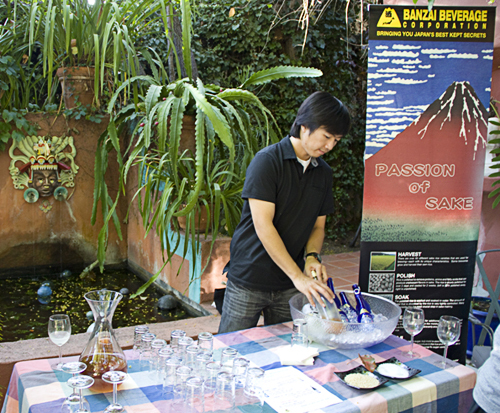 Banzai Beverage, for providing the sake for the event. Zojirushi, who not only provided those 2 amazing rice cookers that saved my sanity, but also provided bags that we used as gift bags for everyone to take home, and fans to use for fanning the hot steamed rice. 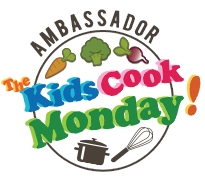 Ergo Chef, who provided awesome knives that made our kitchen prep fun and provided an awesome door prize! And last, but not least, Foodbuzz, for choosing our event to be featured as part of this month’s special 24×24 event, giving us the opportunity to help benefit the OCRF! Without all of you, this event wouldn’t have possible and definitely not as fun and delicious! * Want hear about a guest’s perspective of the event? Check out Mac’s wonderful video about the event on Dishin’ In The Kitchen! So much fun! thank you for letting me be a part of it!! 2.) I love blue sea – Martin & Matt – I love those guys. I mean, seriously, I’ve never met more helpful guys, EVER!! I mean, they didn’t even push me away when I stood around begging for scraps. Their seafood is totally going to be part of my new year’s party! awesome, awesome seafood!! 3.) Tofu – i was eating the rest of the brick in the kitchen while no one was looking. 4.) 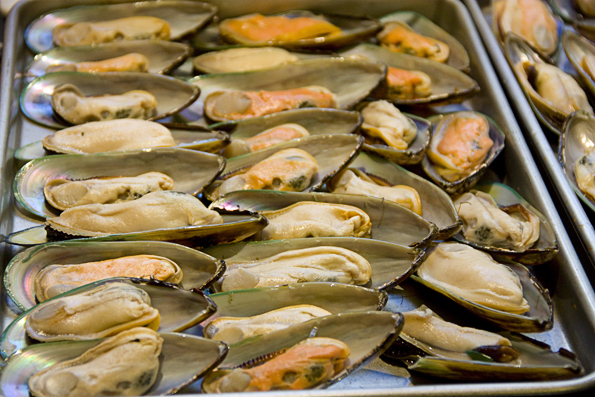 Mussels – even though I told you that mussels freaked me out because I always related them to the shellfish that clung to the venice pier, I was “taste-testing” them for quality. I was taking one [two, three] for the team. :) ok, ok, so theirs was exceptionally tasty. 5.) I was stealing macarons in the kitchen, too. my english is bad, but i want say you that it’s terrible that i don’t live were you live because i would like take part in this amazing event!! i love sushi! I wish I could have been there — looks like you had a blast! 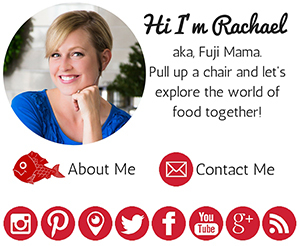 I love how food brings people together — nothing like a common bond to ensure we all get along! Rachael, Oh my goodness! This was has to be the best 24, 24 I have yet to see! How great to have been able to collaborate with all of these people to put on such a fantastic event! Kudos to you my dear!!! Man… you are really making me want to move back to Cali!! Amazing! You put so much work into this event and for a great cause! I love the idea. Everything looks wonderful. I especially like the desserts ;D.
Wow! I have to agree that this is the best 24,24 I have seen! I am so impressed with everyone and everything, yet, at the same time I am so jealous! How about you travel and come to TN?! I am SO sad I missed this! I looks AMAZING. Whens’ the next one? I really love how you put the post together you really captured the essence of the day to the “T”! What a great day this was indeed… everything was beyond amazing, thank you so much! What a grand event…and sushi, yum :) Everything looks amazing. Rache, great presentation. Looks like it was a lot of fun, a lot of work, some great food and some amazing people to be with. Proud of you. I am so impressed with the amount of work that was dedicated to create this event. The food looks amazing and the photos do a great job of showing how much fun everyone had. Wow… You put on quite the sushi event! And, it looks like it was a huge success. Congrats! Super organization. Super event. Just the names of all the seafood had me drooling. Hopefully they’ll be a lot more home sushi makers on the West Coast. Rachel you are a QUEEN! How on earth do you do it ALL? My goodness. This is awesome beyond words. I so wish I had been there. I really want to learn how to make sushi. Looks like a well-organized and fun event. The Sushizuri in particular is beautiful! I would like to learn how to make that. I wish I could have been there. We have a long connection to sushi in our family. When my younger son, Matthew, was eight, he and two friends formed a Sushi Club and come to our house every Wednesday after school to make Sushi. They were all addicted to raw tuna. Matthew still insists that sushi tastes so good it has to be eaten with eyes closed. Your party looks fabulous, thanks for sharing. Sounds like so much fun! Wish I could have attended!! This looks lovely, delightful, tiring, energizing. . . wonderful! Thanks for sharing this with all of us readers out in blogland. And. . .get better soon! 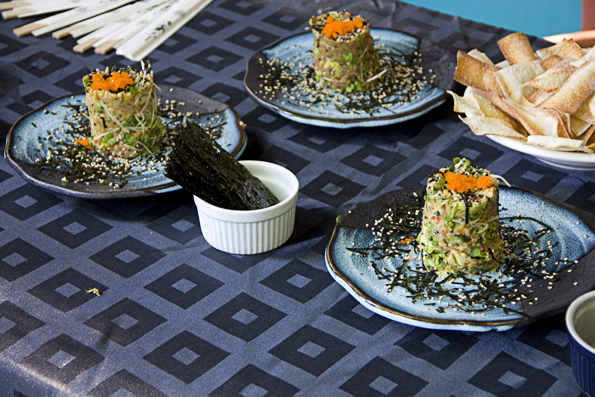 PS: We would like to learn how to make sushi in Toronto too! I wish I could be there! 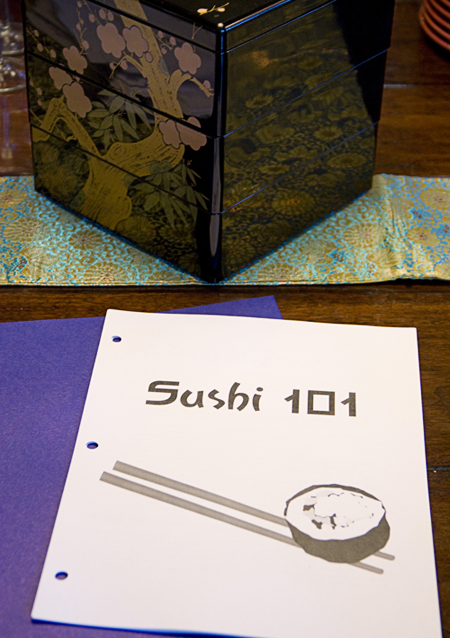 I need a Sushi 101 class. Beautiful post! You certainly know how to put on a wonderful event! Everything looks so delicious. Loved your facial! What a great idea and lovely spread! What a fabulous event!! It’s a gorgeous 24 by 24 and the photos are fantastic! Congratulations Rachel! 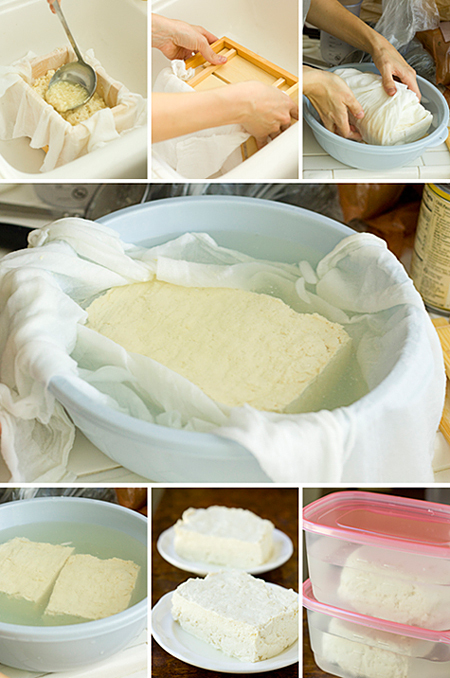 Someday you will have to teach me how to make fresh tofu! This looks like a wonderful and fun event. Wow. What an event. I wish I could have made it to this one. You really know how to throw one heck of a party! You go girl! I saw Mac’s video, and have been meaning to come by here and read all about it. Sorry it took so long! @Kim, You can have your own private sushi dinner whenever you want! I’ve been thinking you and Mr. RGB need to come over for dinner sometime! Everything looks amazing! The presentation – wow! Where did you get those lovely colored round plates?